Recently I had the idea to begin a series of blog posts going more into detail about all the ranges of yarns we carry here at J&S.. from Cobweb up to Chunky! Oliver pointed out, correctly, that we should begin the series with some posts about where it all comes from! So this first post is about the Shetland Breed of Sheep, written by Oliver Henry, manager and top wool man here at J&S.. take it away Oliver.. 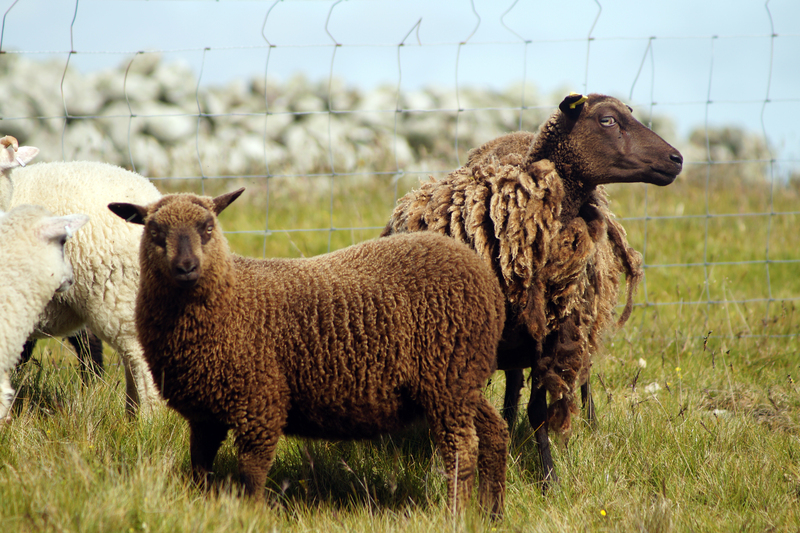 The Native Shetland sheep are part of the North European short tailed breeds and have been linked to breeds such as Icelandic, Finn, Romanov, and Scandinavian breeds’ such as the Spaelsau. It is the smallest of the British sheep breeds and it maintains many of the characteristics of the wild sheep. 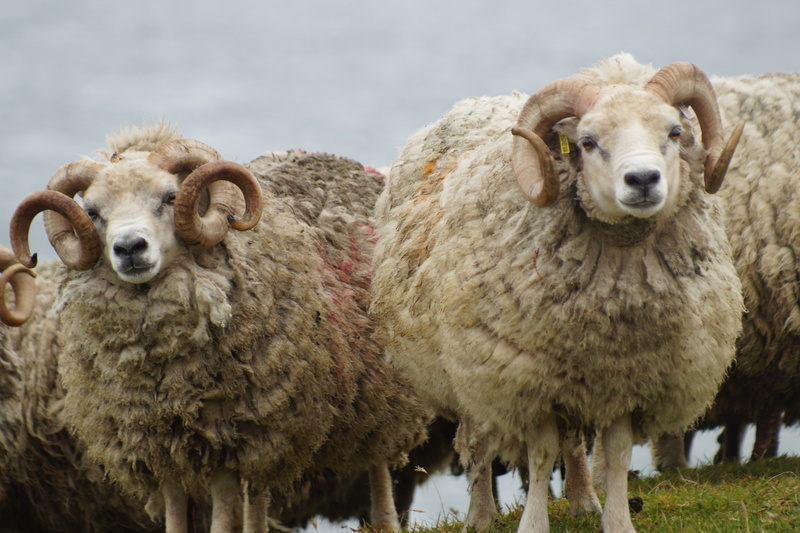 One of the first surveys carried out on Shetland sheep in 1790 published 1814, for the Board of Agriculture, reporter John Shirreff states there are two distinct types of sheep in Shetland, one breed producing a ‘kindly’ meaning fine wool fleece and the other a much coarser fleece. 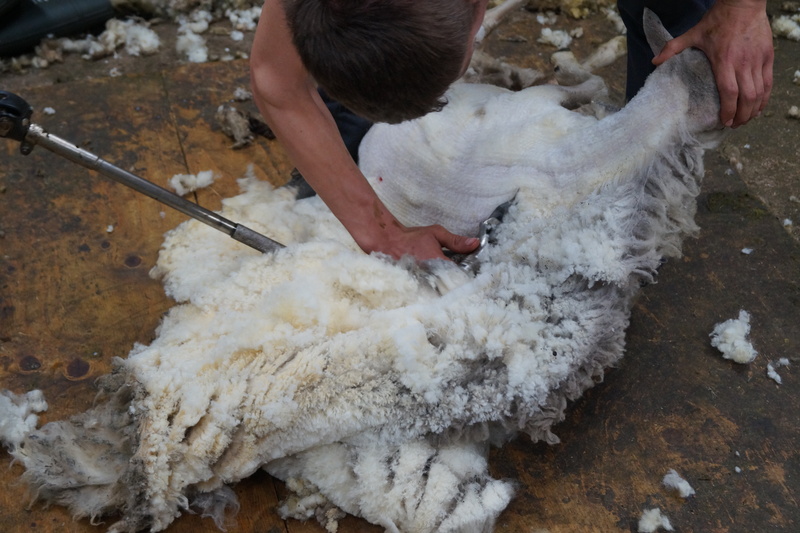 It was natural that these two distinct types would cross breed and produce wool of which could be of mixed quality, and the same applies to this day, hence the need for careful breed selection of fine woolled stock and later on the hand sorting of fleece. These two types would roam the native heather hills and peat moors at will as there were no geographical boundaries such as today with fencing. The common grazing or ‘scattald’ as it is known locally could carry sheep from up to twenty or thirty crofters in an area, all could have different types of rams they would introduce to the flocks, all with different characteristics especially wool. 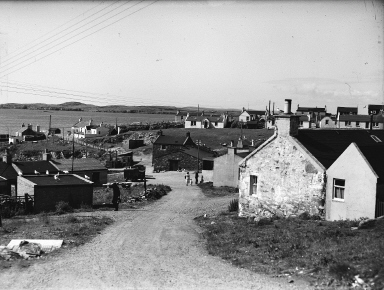 My own experience of crofting, Shetland sheep and its unique traits began at an early age on my native home of Burra Isle, which was mainly a crofting, fishing community. The village I was brought up in was Hamnavoe and it was a common grazing area, sheep could roam freely around the houses and supplement their diet from gardens and vegetable plots, always a source of fierce debate between house holders and crofters! My grandfather had such a croft with a small park which was fenced in where he kept perhaps a dozen ewes, the remainder roamed the village. I fondly remember hand feeding his sheep especially in the winter when grazing was scarce. One particular Shetland ewe named Blackie would come into our house and I would brush the snow of her fleece while hand feeding her. The Island life was predominately fishing, the crofts and sheep numbers were relatively small, the returns from crofting was sparse, the livestock was mainly used to supplement the needs of the family which included their fine wool, which I will deal with later. It wasn’t till I was 10 years old and had the good fortune to meet up with my Uncle Willie Robertson’s family, who lived in the North East of Shetland, in the village of Vidlin, that I came to understand the importance of traditional crofting life and its impact on a rural community and the comradeship of crofters. My summer months were spent on the Robertson croft at Kirkabister in Vidlin, it was here my education of Shetland agriculture and in particular Shetland sheep and wool began. A highlight of my summer was the gathering ‘caaing’ the hill sheep, as many as a dozen crofters would set off with their dogs from differen’t parts of the area, which was very hilly and full of gullies and burns. I marvelled at how they all seemed to meet up at a certain location, most often next a loch, and drive the mass of sheep into the ‘croo’ pen. Here each crofter would select out their own sheep and start hand shearing or in some cases ‘rooing’ their animals. I began to learn how each crofter could distinguish who owned the sheep. This was done by ‘lug’ ear marks, where each crofter had their own “ brand “. If I remember correctly the Robertson family mark was a hole in the right with the tip of the ear shortened and two cuts in the left. A favourite memory of mine was at one of the larger gatherings, I spotted one of the Robertson families black ewes being accidently shorn by a distant neighbour on telling the Johnson brothers, who were representing the lady of what was about to happen and they should point out the mistake. They said no just wait and when the crofter had finished, they went and said thanks for shearing one of the Robertson sheep and took the fleece and handed it to me to pack. These early years being a part of such a rural crofting community combined with the crofter fisherman lifestyle of my own Island gave me a very clear picture and education in to what makes our Island’s culture and heritage so vibrant. On attending the North of Scotland college of Agriculture some years later, I was made aware of how little was known about our crofting way of life and Shetland Sheep in particular. A visiting lecturer an expert on sheep, answered my question on Shetland sheep and its importance to our community, saying it ‘was a bag of bones and of little significant value’ how wrong was he! We can only hope that this important infrastructure can survive the E.U paper trail, passports and electronic ear tags, for when the oil has gone and we once again turn to the land and the sounds of Shetland sheep being gathered in our native hills. Small fined boned animals with erect ears and bright eyes. Very good mothers, and have the ability to live on sparse hill conditions. In some areas can be seen on the sea – shore eating seaweed, to supplement their diet. Very fine wool, fleece weight 1 – 1.5 kilos. The rams are horned, generally rounded in section, though some are angular, the ewes are hornless. We will be back soon with a post on the wool itself before we kick off looking at all the different weights of yarns we make! Thanks for this! Great story and photos. Dont know if you already have this planned or not, but would be interested in reading the process of getting from fleece to the wool itself. e.g. is “carding” still prevalent, or is newer mechanism used? How is the fiber spun into wool? Is cobweb 1 ply and chunky 4 ply? What kind of dyes are used? Are people still using the traditional methods of doing things or more modern methods? can the two work together or are people losing the old skills? Thank you for this fabulous post. Words and pictures both so enjoyable. Thank you for sharing the history of the Shetland sheep. In America they are a most beloved sheep. Spinners love their wool and the farmers that produce that wool love these little sheep for they are usually sweet in temper and almost dog like in their mannerisms. As a spinner, well bread Shetland wool properly cleaned and carded is a joy to spin. But truth be told, I buy as much Jamison yarn as I spin each year as it is a pleasure to knit. Your colors and the many choices of yarns make the stranded color work I do very fun. Keep writing your posts please. Great info. Love the blog idea. Your coned shetland wool is excellent for my jbmachines. So much better than our local Cumbria herdwick. 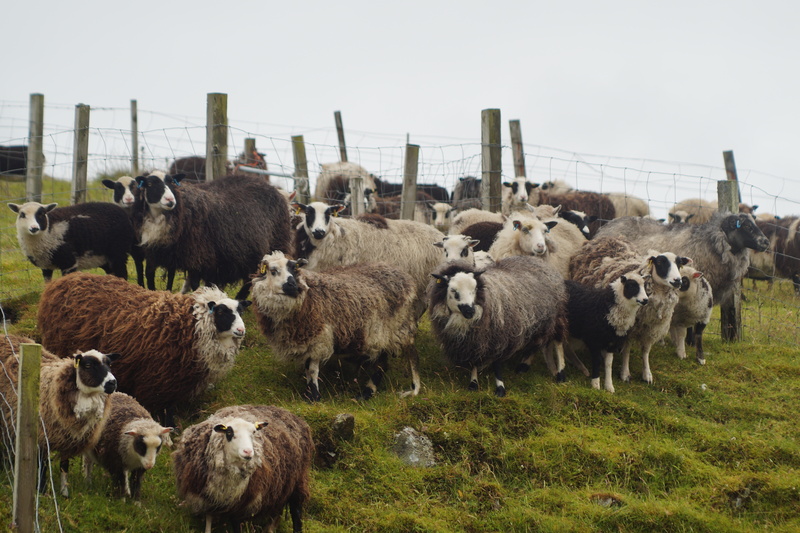 Great post – about Shetland sheep and crofting! Wow. So much work! But I am so glad you do it. P.S. The sheep are adorable. Very enthusiastic about this blog post series! Wow! This was so interesting and also great information. Thank you for taking the time and energy to do this, I am really looking forward to more posts. Gives me something to consider while I knit with your fabulous yarns! Thank you for sharing! I am a hand spinner and I freely confess that Shetland is my favorite fleece to process. Most of the fleeces I get are dual coated and thus give me wool for anything I might think of making, from lace weight yarn for shawls to rugs. I hope, someday, to visit your part of the world. So fascinating–I love the memories of old traditions and that you’re writing them down for future readers. The photographs of the sheep are gorgeous! Thank you for sharing the story of Shetland life and the special Shetland sheep. My fathers family produced sheep for you to use for any years – although was ever a part of that history, you help to bring it to life for me! Please DO NOT stop! I willbe back soon tobuy more wool for knitting! Fascinating reading! Wonderful to hear your personal story Henry. Thank you for sharing it. I have always had a picture in my mind of a ‘Shetland sheep’; it being much like your picture of the rams. I recognized the Shetland fleece on the last photo but sadly to my uneducated eye, not the over all look of the sheep. I had no idea there was such a variance to the over all look of the breed. Always a thrill to learn something new. Many thanks and can’t wait for the next blog in the series. 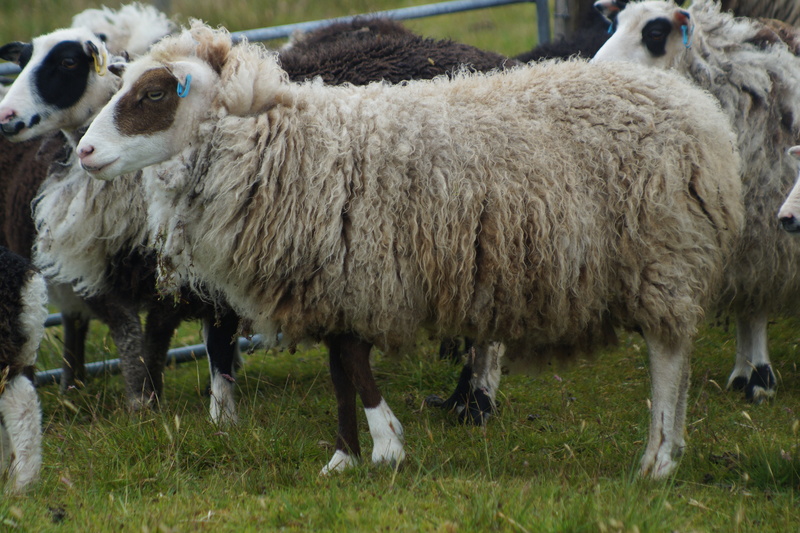 Shetland sheep… a very rich history indeed! Thank you for this lovely post, I look forward to the rest of the series. haha, loved the story of waiting until the the black sheep had been shorn and then saying, thank you! Shetlands a ‘bag of bones’? I think not! I have been around Norman Kennedy for years and there is nothing more interesting to me than Shetland sheep! Thank you. this is a fabulous read! I loved reading the piece about Shetland Sheep and the other responses. I start spinning 7 months ago and am totally hooked on anything to do with sheep, fleece, spinning, weaving and dyeing. Although I have yet to visit the Shetland Islands my maternal ancestors originate from there and my aunt has contact with a relative there. 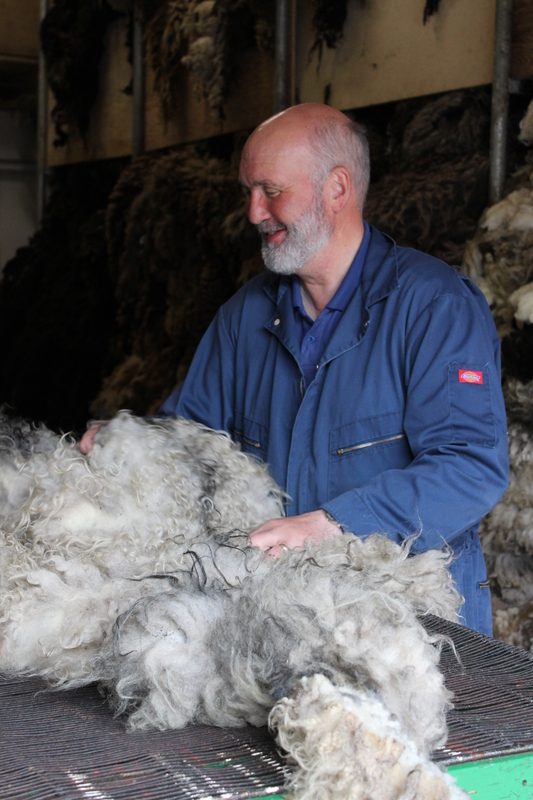 I look forward to other posts – I seem to be going to bed dreaming of fleece these days! This is great and has come at just the right time for me – I was given 3 Shetland fleeces from some sheep who live on a farm in Devon. They are all different, so now I will be able to go through your post and try and identify which ones they are. I look forward to the next one. I am not a spinner, I use natural fleece for needlefelting garden birds, and add a bit of colour at the end from Merino sheep. I am very happy with all this talk about Shetland, the sheep and living. It gives so much back ground information that it becomes even more interesting. Please, continue with this!